NEW BRITAIN — From good food to socializing, keeping political talk to a minimum and dancing — lots of dancing — Mayor Erin Stewart’s recent inaugural ball was, by all accounts, a success. 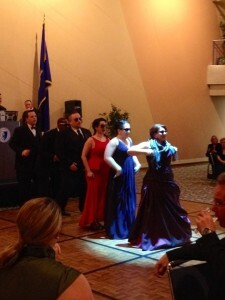 The ball, which was held at the Central Connecticut State University Student Center ballroom and attracted 275 guests, raised about $15,000 for charity and local nonprofits. The money will go into a charitable fund and will be donated to various causes throughout the year, the mayor said Tuesday. The six-hour ball began with the 26-year-old Republican mayor being escorted to the event by her two grandmothers. And the first dance — per Stewart’s wishes — was with her entire staff. Stewart spoke for 15 minutes, but the other speeches were brief. They included comments by Stewart’s father and the event’s master of ceremonies, state Sen. Kevin Kelly, R-Stratford. Kelly was the mayor’s boss during her days as a legislative aide in Hartford. Others in attendance included several aldermen, former Democratic Mayor Bill McNamara and Danbury’s Republican mayor, Mark Boughton. For Stewart, the most fun was watching the city’s new head of the Department of Municipal Development get his mustache shaved off. It was all for a good cause — $400 was collected for the New Britain Boys & Girls Club. That amount was matched by the mayor, bringing the total to $800. Ken Malinowski’s mustache was shaved because of a promise he made to the mayor. Those who attended said the mood was festive and knowing the money raised went to charity made it all worthwhile.